The International Organization for Migration said the latest incident raised the total number of refugee deaths in the Mediterranean this year to more than 365. The bodies of at least 74 refugees washed up on a shore in western Libya after the engine of their inflatable boat was stolen, coastguard and aid officials said Tuesday as Europe continues to try to stop arrivals of refugees from war zones in Africa and the Middle East. The International Organization for Migration said the latest incident raised the total number of refugee deaths in the Mediterranean this year to more than bodies of at least 74 refugees washed up on a shore in western Libya after the engine of their inflatable boat was stolen, coastguard and aid officials said Tuesday as Europe continues to try to stop arrivals of refugees from war zones in Africa and the Middle East. They generally attempt the crossing in flimsy inflatable craft loaded with small amounts of fuel which are intended to get them only as far as European rescue vessels stationed in international waters. The bodies of those who drown are frequently found washed up on Libyan shores. 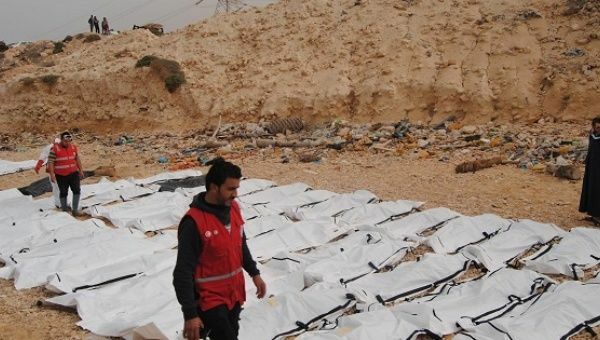 The Red Crescent published pictures of the bodies laid out in white and black body bags along the beach. Some of the images showed a semi-deflated gray rubber boat of the kind typically provided by migrant smugglers, with wooden boards inserted to reinforce the floor, pulled up half-way onto the beach close by. Some bodies were still inside the boat. A local volunteer said the toll could rise, as some bodies had been spotted in the sea but aid workers had not yet been able to recover them. Last year a record 181,000 refugees crossed between Libya and Italy. More than 4,500 are known to have died. The IOM said the latest incident raised the total number of deaths this year to more than 365. The news further highlights the continuing failure of Europe to control the influx of refugees. A controversial agreement between Turkey and the European Union last year to crack down on refugees arriving from Turkey to Greece via the Aegean Sea appears to have worsened the plight of many asylum seekers, who are now being pushed to travel the far riskier option of crossing the Mediterranean from North Africa. Now the European Union is searching for ways to stem the flow of refugees from Libya. This month EU leaders offered Libya money and other assistance to try to reduce the numbers departing across the Mediterranean. Just as with the EU's deal with Turkey, aid groups have criticized the potential deal with Libya, saying such plans exposed refugees to further risks and abuses within Libya. The North African country has been in turmoil since the NATO-intervention in 2011 as two governments compete over power while the Islamic State group and other extremists gain a foothold in the country.